Basher Nitro Circus MT 1/8th Scale RC Monster Truck « Big Squid RC – RC Car and Truck News, Reviews, Videos, and More! Are you a big fan of Travis Pastrana? Can’t get enough of the wacky antics of the Nitro Circus crew? Yes, us too. There is big news from the guys at HobbyKing– a new officially licensed Basher Nitro Circus 8th Scale Monster Truck. Aimed straight at the backyard basher, the Nitro Circus MT comes with 4wd, big tires, and brushless power. 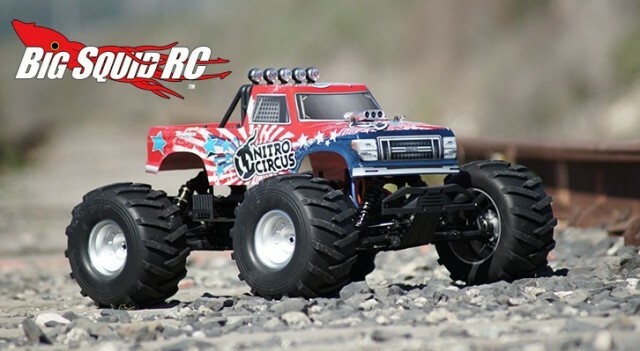 The Nitro Circus MT is a big truck with a width of 480mm, a length of 577mm, and a height of 314mm. A 2075kv brushless motor and 80 amp ESC are used for power. Other highlights include a 3.5mm thick aluminum chassis, 3 gear differentials, big bore oil shocks, and full bearings. There is more information to come on this one, until then check out THIS LINK over on Basher.com. Looking for more monster trucks news? Hit THIS LINK right here on BigSquidRC. Check out the video below to see the Basher Nitro Circus in action. In true Nitro Circus style they even go skydiving with it!